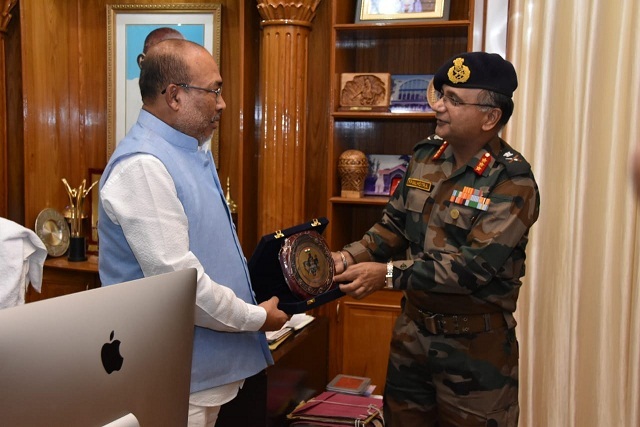 Director General of NCC Lieutenant General PP Malhotra arrived here Thursday on a two-day visit to Manipur from May 24 to review the NCC activities in the state. DG NCC is accompanied by Major General Raju Chauhan, Additional Director General, Northeastern Region. During the visit, the DG NCC called on Chief Minister N Biren Singh, Education Minister Th Radheshyam and Chairman Manipur Public Service Commission to discuss the modalities as to how NCC activities can be improved in the region. The state leaders also assured of maximum assistance from the state. More than 8,000 NCC cadets in Manipur will get benefitted by this. The DG NCC also visited NCC Group Headquarters here where he was given the Guard of Honour by the NCC cadets. He also interacted with the officers and staffs of NCC Group Imphal. During his visit to NCC headquarters here, Brig Vivek Sharma Commander, briefed the DG NCC about the ongoing training activities of NCC in Manipur. Lieutenant General PP Malhotra also witnessed firing skills by NCC cadets at Assam Rifles firing range at Mantripukhri near here and was impressed by the enthusiasm and dedication of the Manipur cadets towards their training. The DG NCC emphasized the need to achieve good standards of training, so that the cadets can achieve laurels at national level.